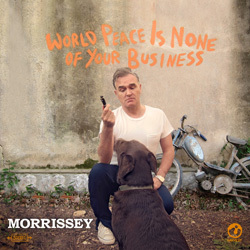 The one-track MP3 download of the title track to Morrissey's 2014 album "World Peace Is None Of Your Business" was originally sold by Amazon UK and USA (and perhaps more; at VBR256 kbps), Google Play (320 kbps) and Big Pond Music (320 kbps). The song was also given away to people who pre-ordered the deluxe edition of the latter album from iTunes in May 2014. The 10" single was limited to 1000 copies worldwide (supposedly; debatable) and copies sold in the USA were numbered. Morrissey at the time of recording of the "World Peace Is None Of Your Business" album. 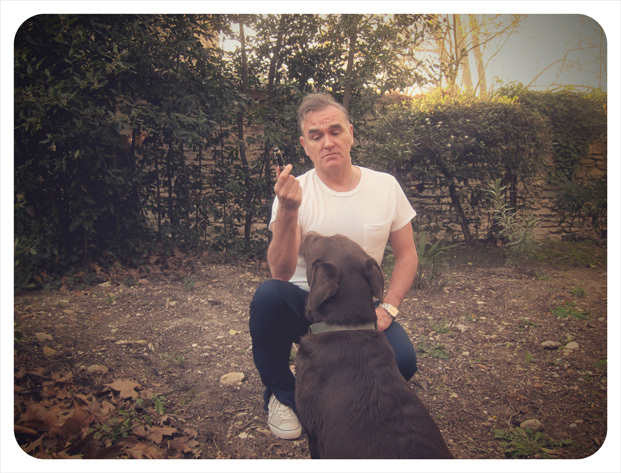 The original image was taken in Avignon, France near the La Fabrique studio where the latter album was recorded, but the background was changed for this single's artwork. 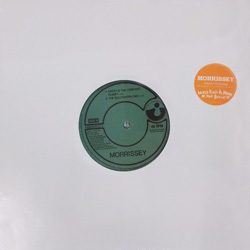 The USA 10" single comes in a generic die-cut sleeve without artwork. USA: The release of the 4-track physical single and very likely that of its parent album were promoted with the help of a 4-track cd [Harvest, no catalogue number] in jewelcase featuring the usual artwork on the front.